I’m going to start off by saying here and now that I know this isn’t the most authentic Chicago-style pizza. I know how protective people are about local specialties. At least, pharm I know I am. So I thought I’d just throw this little disclaimer out before I begin. And so, I’ve been thinking about deep dish pizza for awhile. Ever since the Top Chef contestants made it for their first Quickfire Challenge. And so has Tom, who has been asking when I’d make it for him ever since. 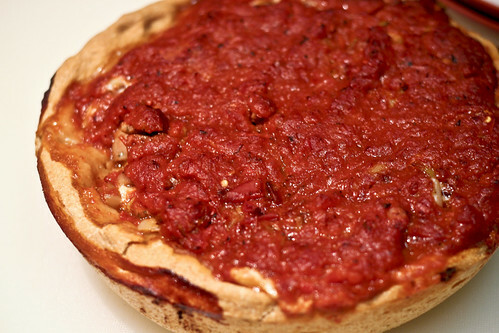 Chicago-style deep dish is like a regular pizza, but kind of backwards. You press the dough into the pan like a pie or tart, layer the cheese first, then the toppings, then the sauce. Oh, those crazy Chicagoans! I was worried I didn’t have the right pan or that the crust would be soggy or that it would just be a big, sloppy mess. But it actually turned out pretty well. Since I was out of mozzarella, I used some sheep’s milk cheese and Havarti, which were nice and melty under the sauce and toppings, and added roasted garlic sausage and leeks for the traditional, hearty feel. Top it all off with a nice spicy pizza sauce and you’re done. It’s a little messier than a New York-style pizza, but was delicious in its own way. Don’t be scared off if you don’t have a deep-dish pizza pan or even the right-sized cast iron skillet. I used a cast-iron sauce pot and it was fine. I just had to be a bit more careful when I took it out. I suspect a 9-inch cast iron skillet would be perfect. Heat a large skillet with the olive oil over medium-high and sautee the leeks and sausages until brown and crisp, about 6 – 8 minutes. Sprinkle a bit (about 1 tsp.) of the coarse cornmeal onto the skillet (prevents sticking), then press the dough into the pan like a pie or tart, with the sides coming up about an inch, leaving a nice indent in which to layer the toppings. Sprinkle the shredded cheese over the dough, then add the sausage and leeks. Spoon the pizza sauce over the top and bake for 30 minutes. Remove from oven and run a butter knife along the edges to make sure the dough isn’t stuck to the skillet. Place a cutting board next to the skillet. Using a thin spatula, carefully pull up the sides, then the bottom of the pie (you may need 2 spatulas here) and transfer to the cutting board. Use a big butcher’s knife to slice it into quarters. This will be messy. There’s no way it won’t be messy. Serves 2 hungry people or 4 with a large side salad. Sautee the garlic with the olive oil for a couple of minutes until fragrant. Add the remaining ingredients and simmer for 5 – 10 minutes. Blend with immersion blender, food processor or standard blender until large tomato pieces are gone. Exiled from Chicago, I had to come up with my own version of the pizza at Caffe Florian on the South Side in Hyde Park. I like a full third of the flour for the dough substituted with corn meal for greater resemblance to the crumbly crust at that restaurant, but I haven’t been able to bring myself to add the shortening I’m sure is in their version. I like your glug of wine in the sauce–I’m going to try that. I had no idea that the cheese went underneath the sauce (or gravy as they call it here in Philadelphia).